An Italian classic with a souprise twist. 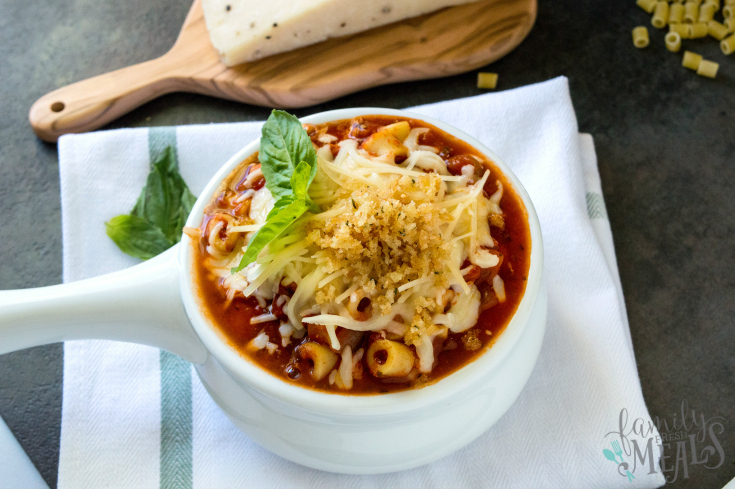 One of my favorite ways to shake up a favorite recipe is to turn it into a soup. 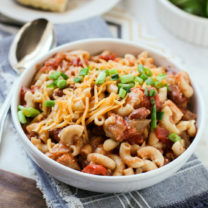 Like my Loaded Crockpot Hash Brown Potato Soup, which is basically a fully loaded baked potato you can eat with a spoon…or my Hearty Slow Cooker Lasagna Soup, which turns lasagna from a multi-step casserole to an easy Crockpot meal. So, deep in the chill of February, my thoughts started turning to soup again. What, I wondered, should I turn into a soup this time? And right away the answer came to me: chicken parmesan. I mean, think about it. 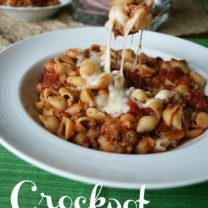 This is such a classic Italian meal, with tender chicken drowning in rich marinara sauce and hot, gooey cheese. What could make a more satisfying soup? 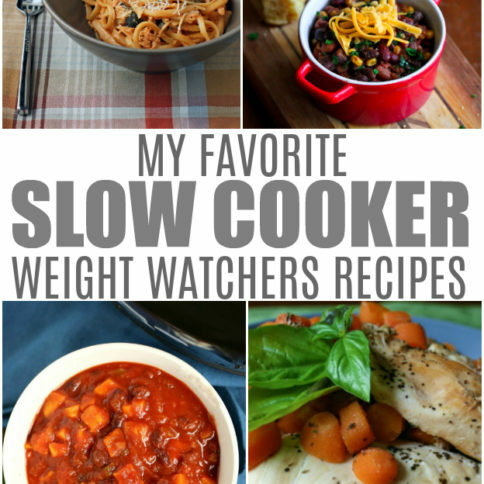 Making it in the Crockpot makes it much easier, too. You can put the chicken, tomatoes, and all the seasonings in to cook in the morning, and half an hour before dinner, stir in a cup of pasta. While that’s getting tender, toast some bread crumbs in a skillet to make that nice, crispy topping that a good chicken parm just has to have. 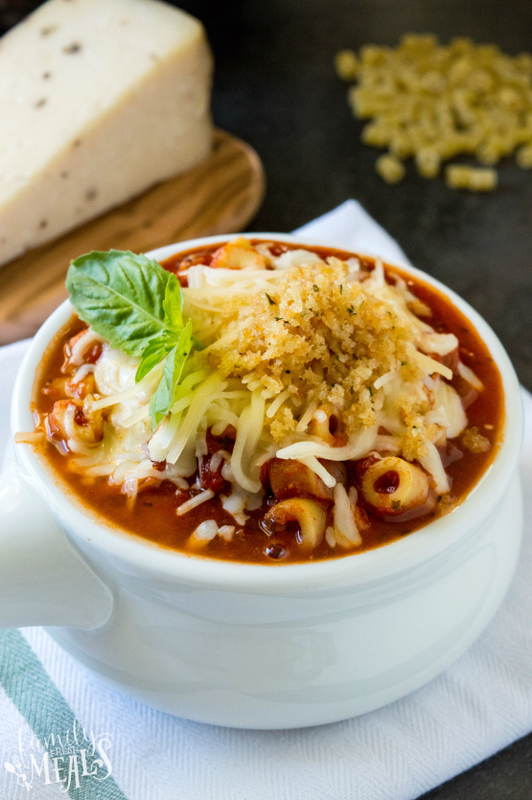 Then dish out this Crockpot Chicken Parmesan Soup, sprinkle the cheese and breadcrumbs on top, and voila! All the flavors of Italy in every spoonful. 1. 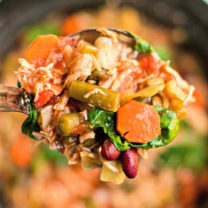 In 4 – 5-quart crockpot, place chicken at the bottom. Season with salt and pepper. 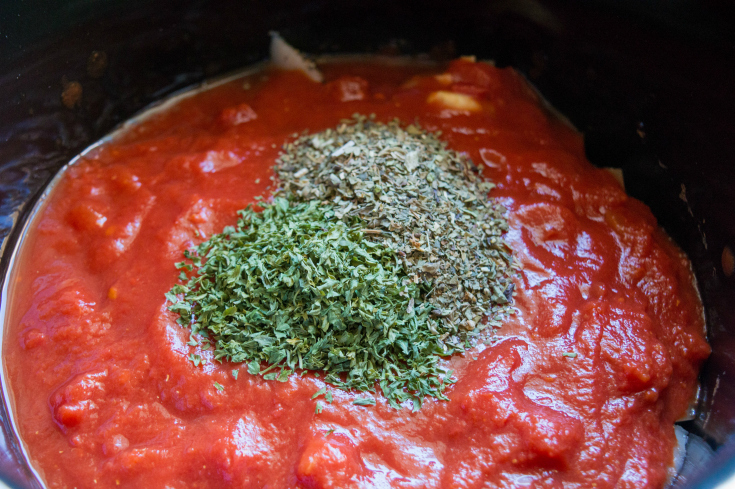 Add in onion, garlic, chicken, crushed tomatoes, dried basil, dried parsley, crushed red pepper, broth, salt and pepper. Stir until well combined. 2. Cover and cook on LOW heat setting 6 hours or on HIGH setting 3 to 4 hours or until chicken is cooked through. 3. Thirty minutes before serving, stir in uncooked pasta into crockpot. Cover and cook on High heat setting about 30 minutes or until pasta is tender. 3. Meanwhile, in a skillet, melt butter over medium heat. 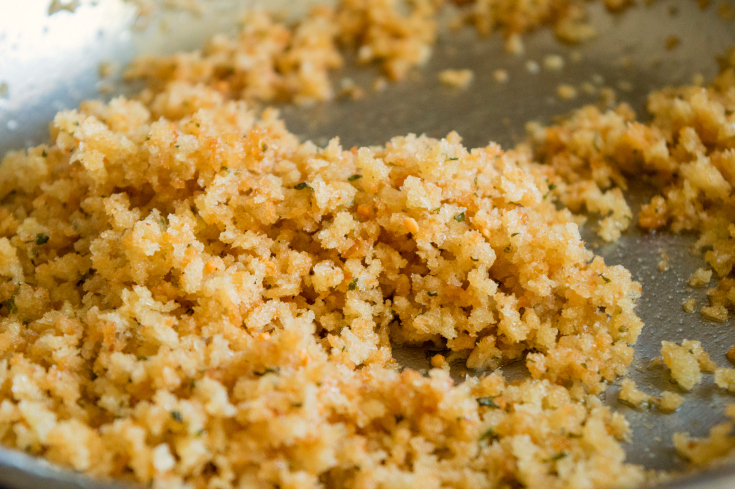 Add bread crumbs and parmesan cheese to the skillet and cook 3 to 4 minutes, stirring frequently, until golden brown. 4. 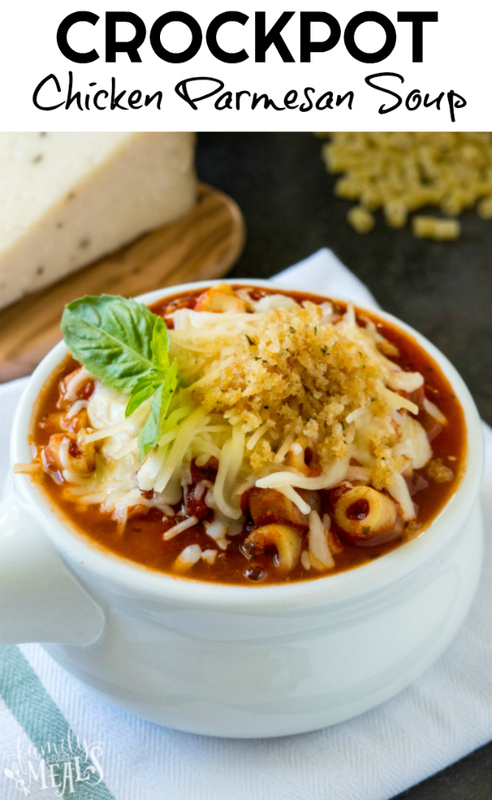 Sere soup topped with toasted bread crumb, shredded mozzarella cheese and top with with chopped basil. 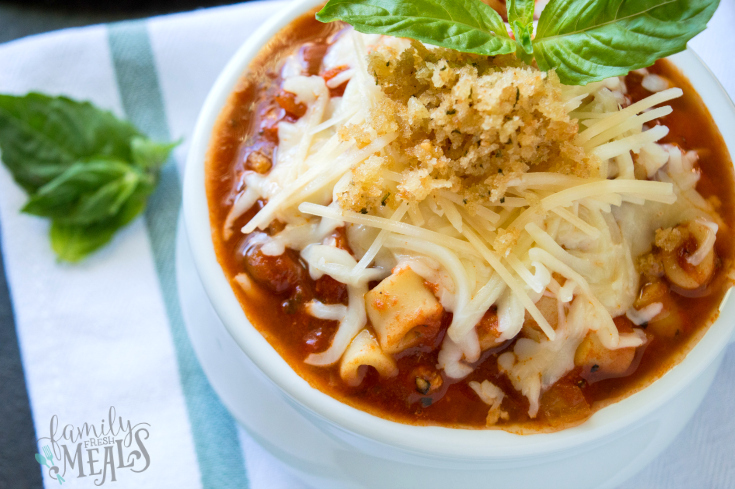 Making this Crockpot Chicken Parmesan Soup makes it much easier, too. You can put the chicken, tomatoes, and all the seasonings in to cook in the morning. In 4 - 5-quart crockpot, place chicken at the bottom. Season with salt and pepper. Add in onion, garlic, chicken, crushed tomatoes, dried basil, dried parsley, crushed red pepper, broth, salt and pepper. Cover and cook on LOW heat setting 6 hours or on HIGH setting 3 to 4 hours or until chicken is cooked through. Thirty minutes before serving, stir in uncooked pasta into crockpot. Cover and cook on High heat setting about 30 minutes or until pasta is tender. Meanwhile, in a skillet, melt butter over medium heat. Add bread crumbs to the skillet and cook 3 to 4 minutes, stirring frequently, until golden brown. 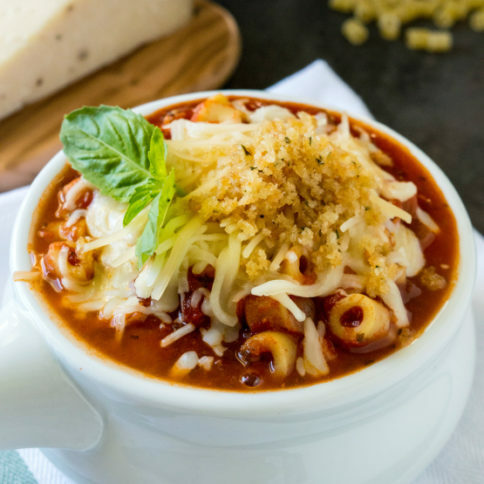 Sere soup topped with toasted bread crumb, shredded cheeses and top with with chopped basil. The Ingredients and Instructions sections of the Printed Recipe are mixed up and illegible. Please correct and re-port. Sorry about that Rick. It is all fixed up now! 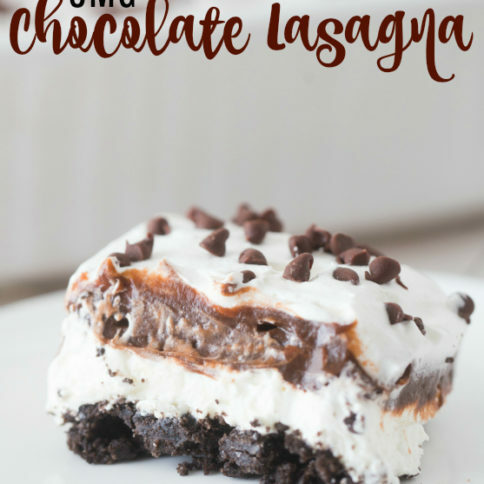 Corey, this is probably the 5th recipe I’ve made of yours. You are my go to for EVERYTHING since the Cowboy Caviar and the Chicken Enchilada Dip I made for a family gathering for my twins birthday and the dishes were eaten up to the last bit.